Laura Izumikawa is a known photographer, known among other things for photographs which reflect different outfits of the world, through her little daughter. 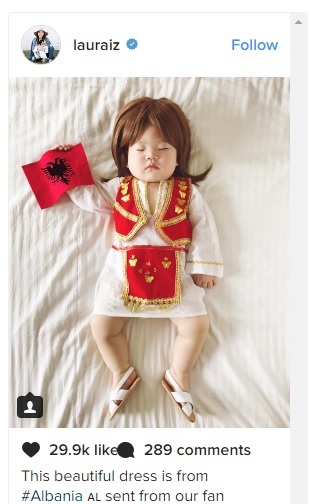 This time the Laura has decided to wear national Albanian dress. This beautiful dress is from #Albania al sent from our fan Celine who now lives in France. It was lovingly handmade by her husband's aunt! Thank you so much Celine and family. We're so honored to have this in our #JoeyWorldProject collection. I looked up photos of Albania and wow, it is a stunningly beautiful country. I've only known Albania as where Mother Teresa was from but having this traditional dress from there in my home makes me feel like I've traveled there. Thank you so much for giving us a taste of Albania. And thank you for teaching me the word urime.